Throughout my youth, I had bad hair. Straight, flat, flyaway hair? Yes, I had that. Permed mullet with a tsunami of bangs? Yes, I had that too. It wasn't until I turned 20 and the lesbians took me for a haircut that things began to improve. Look at my hair - not bad, eh? At least once a week, a stranger will come up and tell me that they just love my hair. They wish they could wear their hair just like mine. These compliments used to make me walk a little differently, maybe swagger just the tiniest bit. I stood a little straighter, head slyly cocked to one side with a look on my face that said, "I know. You just love my hair. Who wouldn't?!" Then one day I realized with horror that the only people that ever compliment my hair are elderly women. Apparently, I've got great hair for a 70 year old. Old ladies are going to start begging me to go with them to their weekly appointment with their hair dressers so that they can have their hair done just - like - mine. Yesterday, I bought some ice skates for an ice skating birthday party on Sunday. 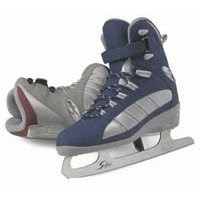 They are described as a recreational skate, a cross between a hockey skate and a figure skate. I bought the gray and burgundy ones. The only color they had. Yes, I bought the orthopedic shoe of skates. When I am out on Powderhorn Lake this weekend, old women are going to hobble over to me and demand to know where I got my beautiful skates. I'll tell them: "You can get them at any major retailer but make sure to tell the salesperson that Vikki sent you so that you'll get the Senior Citizen Discount". It is much better to think of them as cross-trainers, they are so cool, I may have to go out and get a pair!Your hair is cool too, the younger women are just jealous so they have not said anything yet! No kidding, I'm still wearing my grandmother's hockey skates, and they're freezing. Your hair is great. photo request: why don't you do a worst of? i love bad hair photos.your hair is great. striking and sharp. and the skates. i can't keep up with your ever-changing footwear. Bad hair!? Girl, you haven't seen Bruno, Tiago and Mamae when they wake up in the morning across the park from you...I love your Blog.